Last month, writing for Business Insider, Leanna Garfield noted that, “Hundreds of malls and thousands of mall-based stores have shuttered in the past two decades, and many more may close within the next 10 years.” Meanwhile, homelessness, which had been declining as the Great Recession faded, has started to rise again. The federal government in 2017 reported that there were 554,000 homeless nationwide, including nearly 58,000 families with children. The availability of surplus commercial real estate resulting from the decline of shopping malls is not in doubt. As Christopher Leinberger, chair of the Center for Real Estate and Urban Analysis at George Washington University, explained a year ago to NPR’s Robert Siegel, “It’s the middle-market malls that are in biggest danger of going dark.” Overall, the number of malls in the United States has fallen from 1,500 in the mid-1990s to roughly 1,000 today. In 2017, a record 105 million square feet of retail space closed. (That’s enough to hold around 400 of Wal-Mart’s monster-sized Superstores.) This year is on pace to exceed that amount. CNBC helpfully has created a map of big box stores across the US expected to close in 2018. Few communities remain untouched. The options for repurposing malls are nearly endless. But the reality is that many abandoned malls remain… well, abandoned. Such was the case with the Landmark Mall in Alexandria, which shut down in January 2017. 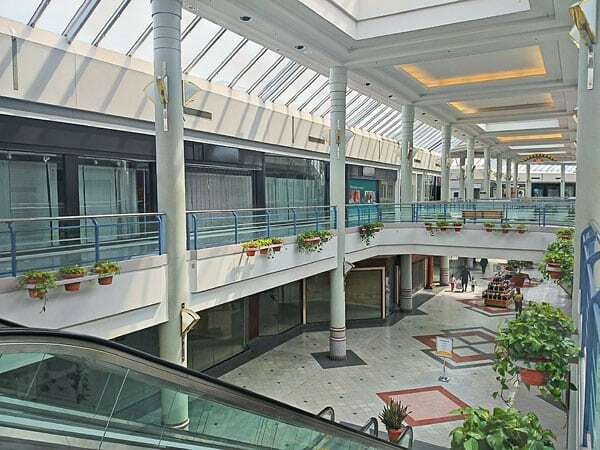 The mall, which opened in 1965 and boasted that “it was the first mall in the DC region to feature three department stores as anchors,” had been faltering for a number of years prior to its final closure 18 months ago. The Alexandria nonprofit Carpenter’s Shelter was inspired in its founding by Father Tony Casey of Blessed Sacrament Church, who from 1982 to 1988 housed homeless people in the church’s basement until the building was torn down. In 1988, after the church building was gone, the nonprofit formed to preserve homeless support. Over the next 30 years, the nonprofit “evolved from a small group of concerned citizens providing little more than bedding on cold nights in Alexandria churches and warehouses into a leader in finding solutions that permanently end and prevent homelessness.” In 2016, according to its Form 990 filing, its revenues totaled $2.26 million. Executive director Shannon Steene needed a place that could “fit 60 beds, had at least 10 rooms, and was within walking distance of public transportation.” When other options proved unworkable, Steene, despite his initial skepticism, set to putting the mall to use as a shelter. Now, notes McCoy, Steene’s office is located “in a corner that had until recently been home to women’s active apparel” in what was once a Macy’s department store. There, a senior official named Mark Bulmash, who had grown up in Flint, Michigan, and knew what it meant to be poor, received an interesting proposition. Could the homeless move in? The company’s agenda was to redevelop the entire space, but those plans were years away, and, meanwhile, all of that empty space would be just sitting there. “It would have been silly not to help,” said Bulmash. So he did, even throwing in free rent. The nonprofit, notes McCoy, had funding for “twelve weeks to gut the building of all that was Macy’s and then in its place build bedrooms, install bathrooms, and furnish a recreation room and cafeteria.” This June, the store reopened as a homeless shelter.